I am pleased to present the 2017-18 Departmental Results Report for the Office of the Registrar of the Supreme Court of Canada (‘Office’). Our 2017-18 Departmental Results Report provides parliamentarians and Canadians with information on what we strive to accomplish and the progress we have made during the 2017-18 fiscal year. The report provides information on our actual results for the most recently completed fiscal year and the financial and human resources needed to deliver those results. The information presented in the report provides a straightforward and balanced account of the actual results that we strive to accomplish, while continuing to provide transparency on how taxpayers’ dollars are spent. We also describe our programs and services for Canadians, our achievements in 2017-18, and how our work has met our organizational priorities. The Office has a deep appreciation for the importance and role of the Supreme Court of Canada (‘Court’). As such, it focuses its efforts on a single strategic outcome, namely that ‘the administration of Canada’s final court of appeal is effective and independent’. Over the course of the period covered by this report, the core work of the Office continued to focus on the processing and management of cases brought to the Court. As was the case in past years, the Court’s decision-making environment in 2017-18 has continued to present risks and challenges. During the course of the last fiscal year, the Office placed a high priority on pursuing its work towards the adaptation of its business processes in an electronic environment, with a view to continuously improve electronic access to the Court’s case files and information, both for internal use by the Court as well as by the public and litigants. In addition to planning and implementing these business transformation initiatives, the Court has also continued to focus on further enhancements of its overall security services which aim to balance the safety of all participants in the judicial process, as well as the basic principles of fairness, access and openness which underpin the administration of justice. I wish to conclude by thanking the entire staff of the Court for their continuing hard work and enthusiasm in serving the Court and Canadians with unfailing professionalism and a dedicated sense of purpose. Their respective contributions are indispensable to the success of what we do to support all facets of the Court’s work. For more information on the Office of the Registrar of the Supreme Court of Canada’s plans, priorities and results achieved, see the “Results: what we achieved” section of this report. Created by an Act of Parliament in 1875, the Supreme Court of Canada is Canada’s final court of appeal. It serves Canadians by deciding legal issues of public importance, thereby contributing to the development of all branches of law applicable within Canada. The independence of the Court, the quality of its work and the esteem in which it is held both in Canada and abroad contribute significantly as foundations for a secure, strong and democratic country founded on the Rule of Law. The Supreme Court of Canada is an important national institution, positioned at the pinnacle of the judicial branch of government in Canada, separate from and independent of the executive and legislative branches of government. The Office provides all necessary services and support for the Court to process, hear and decide cases. It also serves as the interface between litigants and the Court. More detailed information on the Court’s responsibilities, the hearing process and judgments is available on the Supreme Court of Canada website. In accordance with the Supreme Court Act, the Court consists of nine judges, including the Chief Justice of Canada, all of whom are appointed by the Governor in Council. The Court hears appeals from the decisions of the highest courts of final resort of the provinces and territories, as well as from the Federal Court of Appeal and the Court Martial Appeal Court of Canada. In addition, the Court provides advisory opinions on questions referred to it by the Governor in Council. The importance of the Court’s decisions for Canadian society is well recognized. The Court assures uniformity, consistency and correctness in the articulation, development and interpretation of legal principles throughout the Canadian judicial system. Its jurisdiction is derived from the Supreme Court Act and other Acts of Parliament, such as the Criminal Code. The Supreme Court Act provides that the Registrar shall, under the direction of the Chief Justice, superintend the officers, clerks and employees of the Court, report and publish the judgments of the Court, as well as manage and control the library of the Court. The Registrar is appointed by the Governor in Council and heads the Office, being responsible for the management of its employees, resources and activities. The organization of the Office is depicted in the following diagram and further explained in the paragraphs below. 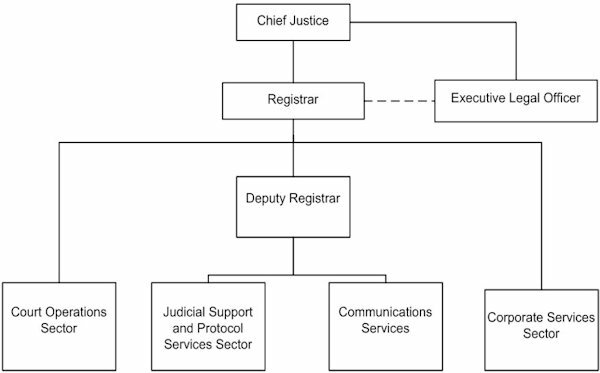 The chart shows the organizational structure of the Court. Under the direction of the Chief Justice, who is supported by the Executive Legal Officer, the Registrar is the Deputy Head of the Court. He is responsible for the Court Operations Sector and the Corporate Services Sector. The Registrar is seconded by the Deputy Registrar, who is responsible for the Judicial Support and Protocol Services Sector and Communications Services. Judicial Support and Protocol Services Sector: The Judicial Support and Protocol Services Sector is responsible for the delivery of all judicial support services to the Chief Justice of Canada and to the judges of the Court, including protocol matters and facilitating the Court’s international role, as well as the development and delivery of integrated judicial support programs and services, judicial support administration, and the Law Clerk program. Communications Services: The Communications Services Branch develops and implements communication strategies, plans and programs to increase public awareness and understanding of the Supreme Court of Canada, as well as responding to requests for information and providing guided tours of the Court building. It also works to enhance internal communications within the Court. Court Operations Sector: Composed of the Law Branch, Reports Branch, Registry Branch and the Library and Information Management Branch, this sector is responsible for the planning, direction and provision of legal advice and operational support for the judges of the Supreme Court of Canada, respecting all aspects of the case management process from the initial filing to the final judgment on an appeal. This includes processing and recording proceedings, scheduling of cases, legal and jurilinguistic services, legal research and library services, legal editing services and publication of the Canada Supreme Court Reports. The Registry is the point of contact between the Court and litigants and provides information and services to counsel and litigants, including unrepresented litigants. Information management services, including case-related and corporate records information, are also provided by the Sector. Corporate Services Sector: Administrative and operational support for all the Court’s judges and staff is provided by the Corporate Services Sector, which is responsible for: strategic, business and resource planning; corporate reporting; management accountability; integrated risk management; finance; procurement; building operations (including telecommunications, mail and printing services); human resources; security; health and safety; emergency management and preparedness; IT services; as well as business continuity planning. The operating environment of the Office is continuously evolving. The focus in recent years has been on business process improvement, information management and enhancing electronic access for litigants and the public. To meet the pressures relating to the aging Court building and operational facilities, significant time and resources have been (and will continue to be) dedicated to long term planning for a building rehabilitation initiative, as well as to short term activities aimed at replacing aging equipment. In recent years, the Court has seen relative stability in its caseload but there continues to be operational pressures on the Office. These arise from the requirement to (i) provide more services to the Court, litigants, and the public; (ii) meet the needs of a significant number of self-represented litigants; and (iii) maintain operations in aging facilities with constricted resources. to manage a robust information security permissions framework to limit access to documents with restrictions as appropriate. The 2017 amendments to the Rules have allowed the Court to address the increasing complexity of proceedings being filed and have improved efficiency. With reduced timelines for filing, the scheduling of appeals is also more efficient. The impact of these new Rules will be monitored and evaluated on a continuing basis. In addition to the above, self-represented litigants filed 27% of the applications for leave to appeal in 2017, which represents a significant percentage of its filings. This underlies the continuous need for the Registry Branch to enhance its resources for self-represented litigants, who require more assistance from staff. The Court is also facing heightened concerns about physical and information security, which must be balanced with the need to provide a secure environment in the context of the operational requirements of a Court which is accessible to the public. As well, when responding to demands by government for operational efficiencies by way of the consolidation of various services, the Office must ensure the protection of judicial and institutional independence. The operating environment is also evolving from an outreach perspective. There is increased public interest in the Court’s cases and growing visibility of the SCC judges in Canada and abroad. As a leader in court administration, the Office must support the Court in that role. The Office therefore continues to dedicate ongoing efforts aimed at ensuring that all resources are used in the most efficient and effective manner possible. On an annual basis, the Office’s operating environment is assessed in terms of its capacity to deal with key high-level risks linked to the achievement of organizational objectives and results. The key risks are identified during the Strategic Planning exercise and are updated on an annual basis. Mitigation measures are also monitored continually to ensure that they are adequate and fully implemented. Unintentional or unauthorized access, use, manipulation, interruption or destruction (via electronic means) of electronic information held by the Court and the electronic and physical infrastructure used to process, communicate and/or store that information. Risk to the security and confidentiality of judicial information and data. Threats to the safety of judges, staff or visitors, and to the security of the building, information and infrastructure. Balancing security measures required for the protection of judges, staff and visitors with the principle of an open court. Failure of aging legacy systems and applications, such as the Case Management System (CMS), as evidenced by system downtime or failure, flexibility of systems to handle new requirements or integrate with newer products, lack of ability of Court staff to address technical issues and to interface systems and data, and systems becoming obsolete and unmanageable if the Court waits too long to redesign and port to a new platform. Lack of enterprise search between information repositories limits knowledge sharing and transfer. Escalating costs of maintaining access to published legal information. Library Management Software requires renewal to allow for interoperability and more transparent search between print and electronic resources. Despite being stable over time, the Office does have ongoing risks which require constant vigilance, as identified in the table above. In response to these risks, the Office is continuing to implement enhanced security measures at the Court – both physical and IT security. These investments enable the Office to increase its security posture and address security vulnerabilities. Once fully implemented, these enhanced measures will ultimately ensure that the cases can proceed without any disruptions, that legal information is safeguarded and that the well-being of all parties involved is protected. These investments span 5 years, followed by ongoing funding. As 2017-18 represents the second year of funding for these enhanced security measures, progress towards mitigating these risks remains on target. The failure of aging legacy IT systems remains a key risk for the Office. The Office dedicates resources (both human and financial) to maintain its asset base and ensures that the core assets that support the Court Operations program are replenished. However, rising costs and fiscal uncertainty are making the replenishment of these assets increasingly difficult. Investment planning is key in planning for these infrastructure investments. Progress is achieved by ensuring that resources are allocated to maintaining these systems (back-up operations, updated tools and ongoing monitoring systems). As well, regular threat and risk assessments are conducted and business continuity plans are being developed. The Office identified a new risk in its 2017-18 Departmental Plan, i.e. the risk of compromised research capacity. Escalating costs in published legal information, the lack of interoperability between the Office’s internal information repositories, searching challenges, and an aging Library Management System, all contribute to this risk. These pressures are mitigated by investing in information management applications to support the consistency and comprehensiveness of internal information, renewing the Library Management Software and reviewing the library collection development policy (including all subscriptions and usage monitoring). In order to render its decisions, the Court requires the support of the Office in the management of its caseload, from the receipt of an application for leave to appeal up to and including the release of a judgment on appeal. This support includes providing services to the litigants; reviewing applications for leave to appeal and preparing advice as to whether leave to appeal should be granted; preparing summaries of the leave applications; providing procedural advice; reviewing and summarizing factums where leave to appeal is granted; receiving, controlling and preserving all incoming case documentation; tracking various time periods to ensure compliance by the parties with the Rules of the Supreme Court of Canada; recording proceedings on appeals; answering queries with regard to cases; editing, and summarizing decisions of the Court; publishing decisions in the Canada Supreme Court Reports, in accordance with the Supreme Court Act; and providing law library services with an extensive collection in both print and electronic formats to support legal research undertaken by users within the Court and members of the legal community. The Court has a consistent record of meeting its objectives in processing cases without delay, providing effective access to Court services and programs, including reference information, and providing reliable courtroom services. At the same time, the Office strives continuously to maintain stakeholder satisfaction and high standards of service quality. To meet the challenges of continuing to provide excellent services to the Court and litigants in an environment of escalating costs and added pressures such as physical and IT security, the focus on business transformation will continue. In the upcoming year, the Business Transformation Program will continue to direct resources to the implementation of digital recordkeeping, workflow enhancements and the development of policies and new software applications in support of recent amendments to the Rules of the Supreme Court of Canada, along with operational guidelines to support efficient Court processes and to further clarify internal business processes. From year to year, there may be minor variances in meeting targets in regard to processing cases. In 2017-18, with the retirement of former Chief Justice McLachlin, the operational priority was the processing of appeals and the release of judgments by the Court. The target set for the number of weeks between the hearing of an appeal and the judgment on appeal was 24 weeks and this was surpassed by three weeks, with judgments being released, on average, 21 weeks after the appeal hearing. With a correspondingly reduced capacity to process applications for leave, the target of 14 weeks set as the number of weeks between the filing of an application for leave and the decision on the application for leave was exceeded by 5 weeks. Nonetheless, the Office of the Registrar maintained stakeholder satisfaction and high standards of service quality. With respect to access to Court services and information, the target of 95% as the level of lawyers and unrepresented litigants in appeals in the Supreme Court of Canada that were “satisfied” or “very satisfied” with the overall services provided by the Registry Branch was 93%, just short of the target of 95%. As the Court changed the survey software used to capture the feedback regarding client satisfaction with the services of the Registry, it was not possible to produce a report for the entire year. In regard to access to reference information, the targets of 95% set for responding to: (a) requests for factual/bibliographic requests for assistance within the service standard of one working day; (b) complex/substantive requests for reference assistance by the date required by the client; and (c) the percentage of users that were “satisfied” or “very satisfied” with library services, have consistently been met over the past three years. Significant changes to the Rules of the Supreme Court of Canada, which came into effect on January 1, 2017, have streamlined the process for appeals. The Office strives to continuously meet its targets and utilizes the information it gathers from past results to constantly strengthen its future work and results. The Judges Act is an Act respecting all federally appointed judges and thereby applies to the judges of the Court. The Judges Act specifies the salaries of the judges of the Court and prescribes other payments to be made to them, namely allowances for relocation, representation, incidentals, conferences, as well as annuities. The Office processes these payments, as required by the Judges Act. The timeliness of various allowances paid to the judges of the Court is assessed internally through the maintenance of receipt and processing dates for individual claims. In an effort to constantly improve its services, the Office has implemented processes to ensure accuracy and an adequate level of satisfaction. The Office has set targets of 95% for the timely processing of payments pursuant to the Judges Act, within service standards of five days and a 2% error rate in the accuracy of the payment of these claims. The accuracy of these payments is monitored on a regular basis. The Office has surpassed its target of 95% for the timely processing of payments pursuant to the Judges Act within its service standard of five days for the past three fiscal years. In fact, the Office has consistently maintained a level of 100% over this period for the timely processing of its payments to judges, which success is in great part attributed to procedures that have been implemented to carefully monitor the payment process, such as generating frequent payment batches to ensure that targeted timeframes are respected. Efforts will continue to maintain the established target. The Office has set a target of 2% error rate in the accuracy of the payment of judges’ claims. Although this target was exceeded for fiscal year 2015-16, the error target rate was surpassed again in fiscal years 2016-17 and 2017-18, with an error rate of less than 1%. Of the 712 transactions processed in 2017-2018, a small number of adjusting entries were needed to correct various errors and the adjustments consisted mostly of errors in financial coding, thus not directly impacting the payment of any amounts due to the recipients. Processes such as reconciliation and frequent reporting have allowed for early detection of errors, in particular, financial coding errors, and corrective action was taken immediately. The Office will continue to dedicate time and effort in the coming year to strive towards maintaining its error rate below its target of 2% as the accuracy level for the payments to judges. The planned results for 2017-18 seek to continuously maintain a high level of accuracy and timelines in the issuance of these payments. Internal Services refers to the activities and resources of the 10 distinct service categories that support Program delivery in the organization, regardless of the Internal Services delivery model in a department. The 10 service categories are: Management and Oversight Services; Communications Services; Legal Services; Human Resources Management Services; Financial Management Services; Information Management Services; Information Technology Services; Real Property Management Services; Materiel Management Services; and Acquisition Management Services. Continued improvements to the security and IT security programs, including policies, operating procedures and practices, equipment upgrades, as well as training and awareness. Ongoing efforts aimed at improving and strengthening key internal controls within the organization. Increased focus of Human Resources (HR) efforts on knowledge transfer/succession planning, more specifically to better identify essential positions and opportunities to streamline services. Launch of a redesigned website to facilitate access to Court information and its proceedings. Increased presence on social media, reflected particularly in increased activity on Facebook and the launch of “Cases in Brief”, which summarize Court decisions in plain language. further enhancements to the Court’s IT Security posture. ensuring that the Office is able to meet its obligations under the Treasury Board Secretariat’s information management policies. Financial, human resources and performance information for the Office of the Registrar of the Supreme Court of Canada’s Program Inventory is available in the GC InfoBase. 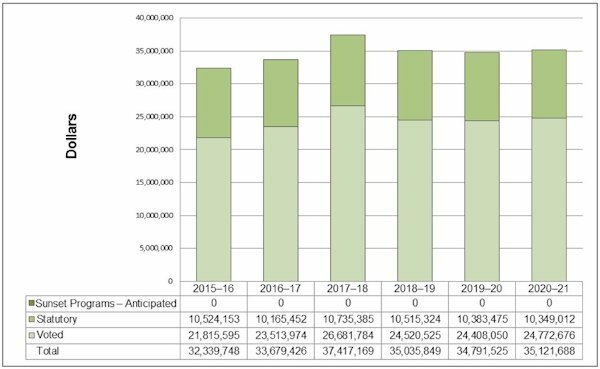 Spending Trend: This graph illustrates the spending trend for actual spending from 2015-16 to 2017-18, and planned spending from 2018-19 to 2020-21. Financial figures are presented in dollars and broken down by statutory and voted items. Planned Spending indicates the amounts the Department is planning to spend: in 2018-19, $10,515,324 for statutory items and $24,520,525 for voted items, totalling $35,035,849; in 2019-20, $10,383,475 for statutory items and $24,408,050 for voted items, totalling $34,791,525; and in 2020-21, $10,349,012 for statutory items and $24,772,676 for voted items, totalling of $35,121,688. The above graph illustrates the spending trend for the Office. Amounts for 2015-16 to 2017-18 represent the actual expenditures as reported in the Public Accounts, whereas amounts for 2018-19 to 2020-21 represent the planned spending presented in the 2018-19 Departmental Plan. The increase in voted spending, starting in 2016-17, is mainly attributable to new funding received for enhancements to the security program. As for the statutory spending, it fluctuates over time in conjunction with the requirements for the judges’ salaries, allowances and annuities (including retired judges or their surviving spouses). The Office’s spending trend remains fairly stable. The increases between 2016-17 and 2017-18 expenditures are mainly attributable to retroactive payments for new collective agreements. The increase in statutory items from 2016-17 to 2018-19 is due to annual increases in judges’ salaries, allowances and annuities. Variances between actual and planned FTEs are due to vacancies arising throughout the fiscal year. For information on the Office of the Registrar of the Supreme Court of Canada’s organizational voted and statutory expenditures, consult the Public Accounts of Canada 2017–2018. Information on the alignment of the Office of the Registrar of the Supreme Court of Canada’s spending with the Government of Canada’s spending and activities is available in the GC InfoBase. The Office of the Registrar of the Supreme Court of Canada’s financial statements (unaudited) for the year ended March 31, 2018, are available on the Supreme Court of Canada website. *For more information, see the Office of the Registrar of the Supreme Court of Canada (ORSCC)’s Future-Oriented Statement of Operations. 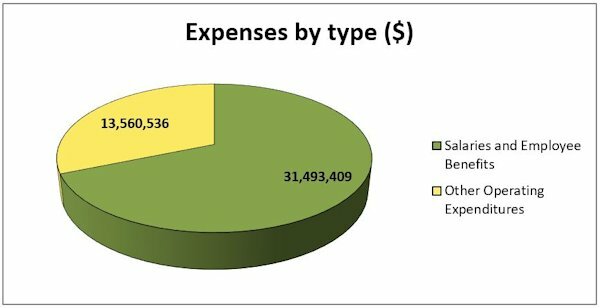 This pie chart shows the 2017-18 expenses by two major categories: Salaries and Employee Benefits and Other Operating Expenditures representing $31,493,409 and $13,560,536 respectively for total expenses of $45,053,945. Total expenses were $45,053,945 in 2017-18; an increase of $4,311,699 (10.6%) over the total expenses of $40,742,246 in 2016-17. Salaries and employee benefits represent the majority of the Office’s expenditures ($31,493,409 or 70%), which increased by $3,482,326 in comparison to the previous fiscal year, mostly due to general salary increases and collective agreements retroactive payments. The net increase in other operating expenditures is $829,373. This pie chart is divided into five pieces. 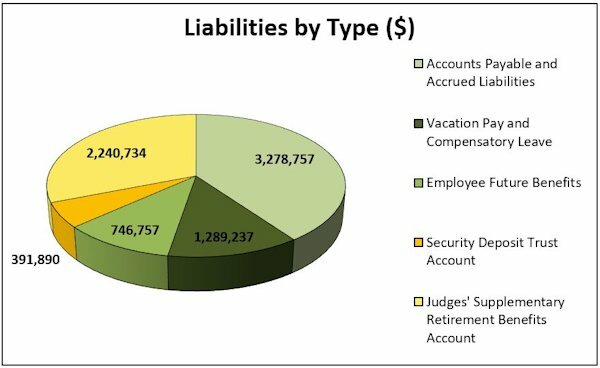 The four largest pieces of the pie are assigned to Accounts Payable and Accrued Liabilities, Judges’ Supplementary Retirement Benefits Account, Vacation Pay and Compensatory Leave and Employee Future Benefits, which represent $3,278,757, $2,240,734, $1,289,237 and $746,757 respectively. The Security Deposit Trust Account represents $391,890, for total liabilities of $7,947,375. Total net liabilities were $7,947,375 at the end of 2017-18; an increase of $1,027,685 (14.85%) over the total liabilities of $6,919,690 for 2016-17. This variance is mainly attributable to an increase in accounts payable and accrued liabilities. This pie chart is divided into four pieces. The largest section is attributed to Due from Consolidated Revenue Fund and represents $5,756,429 of the $7,766,885 total net assets. Tangible Capital Assets represent $1,763,740 and Net Accounts Receivable and Advances and Prepaid Expenses represent $127,280 and $119,436 respectively. 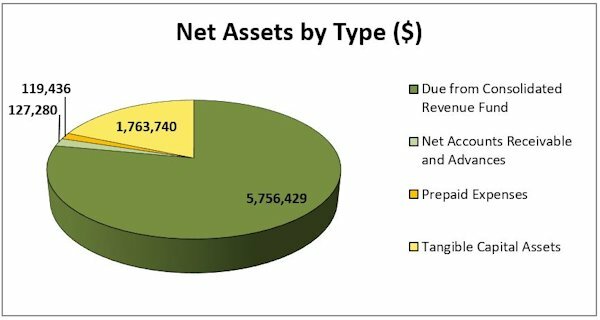 Total net assets were $7,766,885 at the end of 2017-18; an increase of $1,045,450 (15.55%) over the total net assets of $6,721,435 for 2016-17. This variance is mostly attributable to an increase in the Due from Consolidated Revenue Fund account as well as in tangible capital assets. Departmental net debt, calculated as the difference between total net liabilities and net financial assets, has increased by $511,355 compared to the previous year. Net debt will fluctuate from year to year in accordance with the level and timing of both departmental spending and revenues received. Appropriate minister: The Honourable Jody Wilson-Raybould, P.C., Q.C. M.P. Institutional head: Roger Bilodeau, Q.C. The Office’s Strategic Outcome and Program Alignment Architecture of record for 2017–18 are shown below. Financial, human resources and performance information for the Office of the Supreme Court of Canada’s Program Inventory is available in the GC InfoBase.